Same pattern supporting cold in eastern U.S.
One of the fiercest beginnings to winter on record has slammed Europe with relentless assaults of bitter cold and heavy snowfalls. The unusually wintry weather gripping Europe as well as the cold plaguing the eastern United States are linked by a historically strong weather system locked over Greenland. Pedestrians walk during a snow-fall in central London, Saturday, Dec. 18, 2010. Plunging temperatures and heavy snow saw large swathes of Britain grind to a standstill, as London's Gatwick Airport closed its runway and British Airways cancelled flights at Heathrow. (AP Photo/Alastair Grant) (Alastair Grant - AP). In Europe, the strange weather pattern has caused mayhem for holiday travel. Over the weekend, airport and ground transportation disruptions were widespread, from London's Heathrow Airport - one of the world's busiest hubs - to Frankfurt International Airport and the German Autobahn. According to the The Guardian newspaper, Frankfurt airport workers resorted to dressing up as angels in an attempt to calm the situation when crowds of stranded passengers, frustrated by lengthy delays and flight cancellations, became unruly. Heathrow, meanwhile, was closed to arriving aircraft on Sunday, after being closed altogether on Saturday, according to several news reports. BAA spokesman Andrew Teacher told CNN: "These are absolutely ... freak weather conditions ... We've not seen a storm like this in 20 years." So what has been causing this freak winter weather onslaught in Europe, and the colder-than-average conditions in much of the eastern U.S., including Washington? There is a very strong "blocking pattern" in place over Greenland, which is helping to steer a parade of storms into the British Isles and mainland Europe, while pumping abnormally mild air into portions of the Canadian Arctic. In short - the atmosphere is jammed up like the Beltway at rush hour. Storm systems have nowhere to go, and are doing weird loop-de-loops up into the Canadian Maritimes, and even off the coast of the Pacific Northwest. Temperatures relative to average in Wabush Lake, Canada (Newfoundland), on the warm side of the blocking high pressure system, have been much warmer than average as mild air invades the eastern Arctic. Source: NOAA. Meteorologists with Environment Canada described the atmospheric circulation as "one of the most bizarre patterns in recent memory". The high pressure cell parked over Greenland is not your ordinary High. It's unusually strong, and has boosted pressures, often referred to by meteorologists as "geopotential heights", in parts of the Arctic to record levels. For example, pressure typically found at about 18,000 feet above sea level have increased so significantly in recent days that it may have set several records, including the record for the largest departure from average for anywhere on the planet in any month of the year since such historical records began in 1948 (this analysis was performed by the Weather Channel's Stu Ostro). Pressure or "height" departures from average over the Northern Hemisphere. Positive height departures (yellows, oranges and reds) from average are associated with warmer than normal temperatures and negative height (blues) departures are associated with colder than average temperatures. Source: NOAA. These pressure or "height" changes can be clearly seen in the image to the right with the red shades near the southern tip of Greenland indicating the extraordinarily high pressure, as well as this animation, both from the Climate Prediction Center. "Britain's national weather forecaster, the Met Office, said the nation has experienced the heaviest snow falls in December in decades and is on course for record low temperatures. "You have to look back to December 1981 to find similar snow depths," forecaster Helen Chivers said. "If the second half of the month is as cold as the first, this will be the coldest December on record since 1910." According to The Telegraph, Britain's current average temperature for the month of December is running five degrees Celsius below the long-term average for the month. The cold and snow has not only disrupted holiday travelers. A Lady Gaga concert had to be rescheduled when trucks carrying the pop singer's sets could not make it to Paris' Bercy Stadium, the AP reported. Might there be larger forces at work? The current weather pattern is in part related to the North Atlantic Oscillation or NAO, which is a natural climate cycle that influences winter weather in parts of the Northern Hemisphere. When the NAO is in a negative phase like it is now, the likelihood of major snowstorms in the mid-Atlantic increases, as does the likelihood of winter storms in parts of Europe. The NAO was in an extreme negative phase during most of last winter, and has been negative recently as well. The daily NAO index from September through December 19, 2010. Credit: Climate Prediction Center. The current weather pattern may also be indirectly related to long-term climate change. Meteorologist Stu Ostro of The Weather Channel has documented a trend of increased occurrences of atmospheric pressure anomalies, such as the one observed above Greenland, and he believes these may be tied to atmospheric warming from greenhouse gas emissions. Also, recent research indicates that Arctic sea ice decline may influence winter weather patterns. According to the National Snow and Ice Data Center (NSIDC), November sea ice extent was the second lowest on record since 1979. "Typically by the end of November, nearly half of Hudson Bay has iced over. But on November 30, only 17% of the bay was covered by sea ice. Compared to the 1979 to 2000 average, the ice extent was 12.4% below average for the Arctic as a whole," an NSIDC report stated. This year's "Arctic Report Card", issued by the National Oceanic and Atmospheric Administration (NOAA), found that warming water and air temperatures associated with the decline of summer sea ice has been raising the height of atmospheric pressure surfaces over the North Pole. The report noted that the winter of 2009-2010 featured "one of the three largest Arctic high-pressure events since 1850." These higher pressure surfaces are thought to change large-scale wind patterns and can lead to bouts of severe winter weather in the eastern United States. "Models suggest that loss of sea ice in fall favors higher geopotential heights over the Arctic. With future loss of sea ice, such conditions as winter 2009-2010 could happen more often. Thus we have a potential climate change paradox. Rather than a general warming everywhere, the loss of sea ice and a warmer Arctic can increase the impact of the Arctic on lower latitudes, bringing colder weather to southern locations," the report stated. how much snow do these european cities average annually? Global warming, the heating of the atmosphere by increased amounts of industrial gases, is now accepted as a reality by the international community. Global cooling is rearing its ugly head in 2009-2010-2011. Get some snowballs and wake up. Its not a freak occurrence. Its the new normal. That's a great article. Thanks for sharing. OMG, A Lady Gaga concert was affected by the weather!!!!!!!!!! Seriously, people, including that sort of stuff is just filler in a serious news report on weather. Plus, calling it freakish is misleading. It's cyclical. When I was growing up in Germany in the 1960s, 70s and early 80s, we had similar winters, with cold, snowy conditions. A combination of La Niña and the North Atlantic Oscillation are at work. Let's not do climate science and meteorology a disservice by sensationalizing weather news. Only the WaPo could tell you, with a straight face, that this extremely cold and snowy year is because of 'global warming'.........oh wait, 'climate change'. I just wish they would tell you that until India and China decide to completely implode both economies there isn't anything that any of us can do that will alter any real or perceived 'global warming'. "Storm systems have nowhere to go, and are doing weird loop-de-loops up into the Canadian Maritimes, and even off the coast of the Pacific Northwest." Any observations on how well the forecast models handle these conditions? Are these off-nominal conditions making it harder to forecast storms this winter? alance - 2010 was the warmest on record...what was your point again? You do understand the difference between weather and climate right? One interesting anomaly of the last great glaciation is that the "Beringian" land bridge between Siberia and Alaska was above sea level and rather dry during the glaciation...enabling the migration[s] of Asians--later Native Americans--to the New World. It's now though there were two separate crossovers via the land bridge plus a possible third [Inuit or "Eskimo"] migration from Siberia to North America by boat. Lowering of sea levels due to the glaciation served to open the Beringian overland land bridge--and also led to the attachment of the British iIsle to the European Continent. During the Ice Ages, the Thames River was actually a tributary of the Rhine...the undersea canyons below the English Channel link the Thames and Rhine valleys. JeffReid: Warming air and water melts ice. Rapid infusions of ice and cold ice-melt water cools the warmer parts of the ocean, bringing colder conditions to the middle temperate latitudes. This is so simple even a child can understand it. Why can't you? Global warming doesn't mean rainforest temperatures. It can mean that conditions just cold enough to keep ice frozen warm up just enough to melt it -- that doesn't mean it's time to break out the Bermuda shorts. Out of curiousity, when was the last time the temperature was below zero in DC? I bet it was many many years ago. 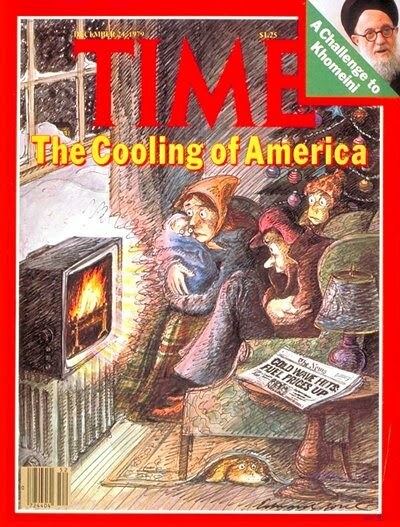 I remember Christmas 1980 when it was -26 where I was in upstate NY. My Dad had to borrow a ladder from a neighbor to get our stubborn cat out of a tree. She snuck out and we weren't about to let her stay out there until she came down on her own. CM_in_Fairfax: You asked an interesting question, which I don't know the answer too. One thing is certainly true - the computer models had a terrible time coming into agreement about the current ocean storm that threatened to be a nor'easter this past weekend. When you have such an anomalous pattern, it has to be at least possible that some models won't perform very well. But how, and why, is probably a very challenging thing to address. bberwyn: I don't think that covering the reasons for these weather events constitutes "sensationalizing" them, as you stated. CM_in_Fairfax, I recall several days of below-zero temps at least during one winter earlier this decade. Cold enough to freeze our water supply valve. "This is so simple even a child can understand it"
First a nitpick, the arrows in the diagram are off. Our cold air comes from NW Canada, NE Canada is actually warm right now. See http://weather.unisys.com/surface/sfc_con_temp_na.html Europe's cold from the NE (ultimately from Siberia), not from Greenland. I agree with bberwyn who said Europe used to be colder and stormier (and disagree with plattentektonik). I think this last few decades of warmer and calmer conditions is reverting to cooler and stormier conditions (and also hotter in the summer). As for the ice melt cooling Europe, the ice melted last summer, now it is refreezing so not a good explanation. The suggestion that lack of ice or anomalous warmth has something to do with NAO or blocking high placement is dubious. It is not "warm" by any stretch of the imagination up in the Arctic, it is a warmth anomaly, i.e. less cold than some arbitrarily chosen time period (probably 1970-2000). That less cold state does not affect the broader weather patterns, it is mostly a result of those patterns. The causes of blocking and negative AO and NAO are other global patterns and solar factors as has been the case in history and prehistoric times. Having experienced last year's severe winters both in the Mid-Atlantic and Mid-Europe, I wonder if this is going to be the new trend, (at least until the Arctic warms up a lot more). TGT11: "when you speak to others this way, it suggests that you are out of rational arguments"
I am frustrated with people who pretend not to understand how warmer air can cause cooler water, even when the explanation is right in front of them in very simple terms. It makes perfect sense. If you send tons and tons of ice and bare-above-freezing water into the warmer waters of the Atlantic, it will make that water cooler. jeffreid would like us to think that Andrew is doing some kind of implausible hocus-pocus here, but this is just simple, elementary physics. There's nothing the least bit implausible about it. The rational argument is already laid out, and jeffreid ignores it in order to get what he thinks is a very clever barb in. That does not make me optimistic that repeating the rational argument would do any good. How do you think this will continue to affect travel into London from the US? What day would be the best try to change a ticket from DC to Heathrow? @TGT11: In the 1970s there was no scientific consensus of global cooling. In fact, a majority of scientific papers predicted future warming on a scale of decades to a few centuries. * The story never really changed in the scientific community. It grew and was eventually captured by the media's relatively short attention span. If all the ice melted, sea levels would rise to a maximum of 250 feet. Granted, such a rise would be catastrophic, but no one is suggesting that this global warming will cause that extreme scenario. However, the projected worst-case scenarios could have Barrow, AK, flooded -- it is on the coast and no more than 30 feet above sea level. There might not have been scientific consensus about global cooling, but there was the same media hype and sky-is-falling rhetoric we've seen with global warming, then climate change, and whatever it will be called in ten years. In the 90s, I remember hearing how DC would have the climate of Atlanta by 2010, that Buffalo and Toronto would moderate to average highs in the upper 30s, and that palm trees would make their way further up I-64 towards Richmond. Why can't anyone at least admit they got it wrong? The current "GW can create more cold and snow" goes directly against what was claimed 15-20 years ago. @fedemployee2 Brussels is out of de-icing fluid, and British Airports has said 2/3rds of Heathrow flights will be canceled between now and Wednesday, and that delays and cancellations will extend past Christmas. 5 of the 6 flights scheduled from Dulles to Heathrow tonight have already been canceled. I am from the UK and i can say last night was the coldest i can remember, we do not get cold like many part of the US, but Northolt where i am from is a extreme weather hub for London, we normally get the highs & lows for London, i think last night was -14 degrees, then i think -3 in the daytime, i cant remember the last time it was that cold, our last three winters have been our worst in my memory and we in Northolt recieved our most intense snow for a long time, 11cm in 2 hours, probably not much to you guys but we are not built for it, my mums car slid all the way down our hill and we could not get to the top, abandoned in the end! More snow forecast, Hurray! Depends what terminal you are flying into, i heard 1&3 are completely closed and the previous comment was correct about the 1/3 of flights, however i am in Northolt near Heathrow (about 4 miles) and it has been snowing heavily for the past hour, expected to snow again tomorrow night and wednesday daytime so i expect the cancellations to get much worse, unless it is vital that you get here i would forget it for a week or two, hotels are all gone aswell, the problem is space, there is not anywhere to move the snow to and it is too cold to melt at all, good luck mate. Both this article and the comments have been really intriguing. I wonder if this sort of occurrence will become the norm--in other words, that progressively warmer Arctic temperatures will actually make this century's European and East Coast U.S. winters cooler than what we've seen. People have always mentioned (or at least should have mentioned) that uneven warming patterns would characterize this global warming trend. As far as the European snow, part of me thinks it's awesome to see so much snow in the U.K., but perhaps the more rational side fears for the situation of the homeless and others who are having trouble with heating bills. It's easy for me, sitting in a nice warm house, to celebrate record lows and heavy snow, but plenty don't have any warmth at the moment. I just hope they have enough shelter space. Reiterating a previous post, please do not confuse "Weather" with "Climate". The fact that you have more or less snow in your backyard this week then you did last year only points to a different weather pattern and may or may not be related to long term changes in climate. Second, to question why scientists are altering their predictions from the past three decades is silly. The field of meteorology and climate science is still in its infancy. It has only been 50 years or so since it migrated from a hobby to a full fledged scientific endeavor. Of course our understanding will change. Additionally, when you comment on predictions made from the 70's and 80's and their relevance or irrelevance you are completely ignoring the advances in the field relating to our fundamental understanding of the underlying physics not to mention the remarkable advances in computing and satellite technology (our ability to monitor and observe climate and weather patterns). Evolving our understanding, gaining new insight and refining ideas and theories is a fundamental process in the scientific method… so yes, explanations and theories will change, but the strong signals we already see will remain strong. You CANNOT argue with the fact that many locations on earth have seen significant changes to their climate in the last 100 years. If you want to chalk it up to only sunspots then you aren't really paying attention to all the facts. Let me give you an example of our state of understanding: everyone is familiar with our basic physics equation F=ma, yes? Nice and simple, thank you Newton. But it is just a byproduct of the conservation of momentum assuming a constant mass. Now if you allow mass to change, then you lead yourself (with many steps in between) to E=mC^2 (thank you Einstein). Did this entire understanding come overnight… NO. Is each part of the puzzle important, yes… does our interpretation evolve with each insight, yes. Please don't convince yourself that by poking holes in scientific interpretation, you are negating the outcome of the fundamental physics. Personal interpretation of the above: it doesn't matter our interpretation, we are abusing our planet and its natural resources… end of story, CO2 induced GW or not, our actions are not sustainable. These significant deviations to the weather and climate patterns we are used to are incredibly interesting (if not a harbinger of things to come) and if it results in more snow for me in DC at least I will be happy again this winter. "The field of meteorology and climate science is still in its infancy. It has only been 50 years or so since it migrated from a hobby to a full fledged scientific endeavor"
And yet we are told to re-organize our economy based on climate science's ever changing conclusions. First, we're too cold, then too hot, then too cold because we're too hot. With such inconclusive results, it's probably not a good idea to start smugly telling everyone else how to live their lives. Imagine if doctors changed their minds on whether you should smoke every ten years. The Earth has withstood far greater stresses than a .7 degree rise in temperatures over a 100 year period. But the real issue here isn't the well-being of the planet, but rather the emotional fragility of scientists who don't feel powerful unless they can come up with a reason for people to pay attention to them. wow, there's a lot of science in this article, which is hurting my small evangelical head. Can't we all just agree this is God's revenge on a sinful society and leave it at that? You can argue about the computer models all you want, but in recent years the the amounts of arctic sea ice have dramatically decreased, and glaciers have been melting. Clearly something big is going on up there. Yeah, whatever. Curious that these climate science geniuses never manage to predict anything accurately, but always have an answer ready when reality contradicts their prior predictions. "The Earth has withstood far greater stresses than a .7 degree rise in temperatures over a 100 year period. But the real issue here isn't the well-being of the planet, but rather the emotional fragility of scientists who don't feel powerful unless they can come up with a reason for people to pay attention to them." Actually, thoughtful people realize the real question is not the future of life on earth, nor the whining of ignoramuses who refuse to move beyond their junior high school resentment at having to take boring science classes, but the future of human civilization as we know it. A wiser man than me once observed that the first rule of intelligent tinkering is not to lose the parts.